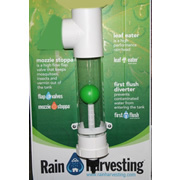 Rain Harvesting - Downspout First Flush Water Diverter Kit - 4"
Rain Harvesting - Downspout First Flush Water Diverter Kit 3"
Rain Harvesting - Post/Wall/Stand Mounted First Flush Diverter Kit 12"
- Helps reduce pollution of your tank water! 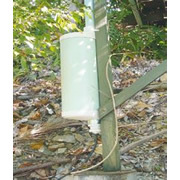 First Flush Water Diverters improve rainwater quality and safety, help extend the life of pumps (used to distribute rainwater for use in and around the home) and internal appliances that draw upon rainwater (such as laundry, toilets, hot water systems and dishwashers), and reduce tank maintenance. The first flush of water from the roof can contain amounts of bacteria from decomposed insects, skinks, bird and animal droppings and concentrated tannic acid. It may also contain sediments, water borne heavy metals and chemical residues, all of which are undesirable elements to have in a water storage system. First Flush Water Diverters (or Roof Washers) capture the first most contaminated rainwater from the roof and gutters, automatically diverting the subsequent cleaner rainwater to the storage tank. As the water level in the diverter chamber rises the ball floats, and once the chamber if full, the ball rests on a seat inside the diverter chamber preventing any further water entering the diverter. The subsequent flow of water is then automatically directed along the pipe system to the tank.